Here is the list of the hotels near Saint-Sozy. Book your hotel near Saint-Sozy today, Wednesday 15 May for the best price, reservation and cancellation free of charge thanks to our partner Booking.com, leader in on-line hotels reservation. Below here is the list the 50 closest hotels of Saint-Sozy, sortable according your criteria. You will find the position of these accommodations on the Saint-Sozy hotels map. Holiday home Le Bougayrou I-811 is set in Le Bougayrou. Guests staying at this holiday home have access to a fully equipped kitchen. The holiday home includes 2 bedrooms and a living room with a TV and a DVD player. Sarlat-la-Canéda is 45 km from the holiday home, while Brive-la-Gaillarde is 49 km from the property. The nearest airport is Brive Dordogne Valley Airport, 28 km from the property. Boasting garden views, House Lacave - 4 pers, 76 m2, 3/2 1 is situated in Lacave, around 2.7 km from Lacave Caves. Guests staying at this holiday home have access to a fully equipped kitchen. The holiday home is equipped with a TV. The nearest airport is Brive Dordogne Valley Airport, 28 km from the holiday home. Located in Pinsac, Bungalow - Pinsac offers a private pool. Featuring free WiFi, the property also has barbecue facilities. This holiday home has 3 bedrooms, a TV, and a kitchen with a dishwasher. The holiday home offers a children's playground. A garden and a terrace are offered at the property. Sarlat-la-Canéda is 35 km from Bungalow - Pinsac, while Brive-la-Gaillarde is 44 km away. Brive Dordogne Valley Airport is 28 km from the property. Located in Rocamadour, 5 km from Merveilles Cave and 5 km from Monkey Forest, House Gite les 4 epis offers air conditioning. The Rocamadour Sanctuary is within 8 km of the holiday home. The holiday home has a TV. The kitchen features a dishwasher. The nearest airport is Brive Dordogne Valley Airport, 30 km from the property. Situated 7 km from Lacave Caves, Rocamadour 2 is in Lacave and features water sports facilities and a tennis court. This holiday home provides barbecue facilities. The holiday home features 3 bedrooms, a TV and a fully equipped kitchen that provides guests with a dishwasher. The holiday home offers a terrace. There is a garden at this property and guests can go horse riding nearby. The nearest airport is Brive Dordogne Valley Airport, 31 km from the property. Situated in Lacave, 7 km from Lacave Caves, Rocamadour 1 features a garden with a barbecue. This property offers access to tennis at the tennis court. With direct access to a terrace, this holiday home comes with 3 separate bedrooms and a fully equipped kitchen. A TV is provided. Horse riding is possible within the area and the property offers water sports facilities. The nearest airport is Brive Dordogne Valley Airport, 31 km from the property. Offering water sports facilities and a tennis court, Rocamadour 12P is set in Lacave, 7 km from Lacave Caves. This holiday home also has a private pool. The holiday home has a TV. The accommodation is equipped with a kitchen with a dishwasher and an oven. The holiday home offers a barbecue. Horse riding can be enjoyed nearby. The nearest airport is Brive Dordogne Valley Airport, 31 km from Rocamadour 12P. Offering a garden with a terrace and barbecue facilities, Chalet Rocamadour is a holiday home located in Lanzac. Free WiFi access is available in this holiday home, as well as wired internet access. Guests can there enjoy a seating area with a flat-screen TV and a bathroom with a shower. There is also a washing machine. Meals can be prepared in the house’s fully equipped kitchen with a dishwasher and kitchenware. Guests will find a dining area. Free bicycles are available on site. 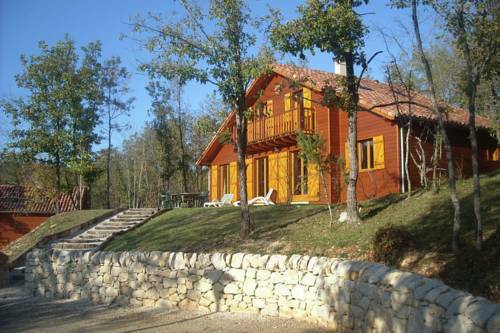 Horse riding and hiking can be enjoyed in the surroundings and the Dordogne River is just 1.5 km from this property. Souillac Train Station is a 9-minute drive away. Free on-site parking is possible. The Hotel de la Promenade is located in Souillac, 28 kilometres from Sarlat-la-Canéda and 1 km from the Dordogne River. It offers air-conditioned rooms with free Wi-Fi internet access and Canal + channels. Guests staying a minimum of 2 nights have free access to the Quercyland leisure park (open from June to September), which is just a 10-minute walk from the hotel. Guests can enjoy a daily buffet breakfast in the dining room or on the veranda. There is also a garden patio. The half-board option includes breakfast and dinner with wine. There is a free public car park at the rear of the hotel for guests arriving by car. Featuring accommodation with a terrace, Chalet Souillac Golf & Country Club Deluxe II is located in Souillac. The accommodation is 28 km from Sarlat-la-Canéda. This 3-bedroom chalet comes with a seating area, a TV, a DVD player and a kitchen with a dishwasher. The bathroom features a shower. Guests can also relax in the garden. Brive-la-Gaillarde is 37 km from the chalet, while Rocamadour is 28 km from the property. The nearest airport is Brive-La Roche Airport, 37 km from Chalet Souillac Golf & Country Club Deluxe II. Situated in Souillac, Chalet Souillac Golf & Country Club Deluxe III provides accommodation with a terrace and free WiFi. This chalet has a garden. This 4-bedroom chalet comes with a seating area, a TV and a kitchen with a dishwasher. The bathroom comes with a shower. Sarlat-la-Canéda is 28 km from the chalet, while Brive-la-Gaillarde is 37 km away. The nearest airport is Brive-La Roche Airport, 37 km from the property. Set in Souillac in the Midi-Pyrénées region, Souillac Golf & Country Club 6P Deluxe features a garden. 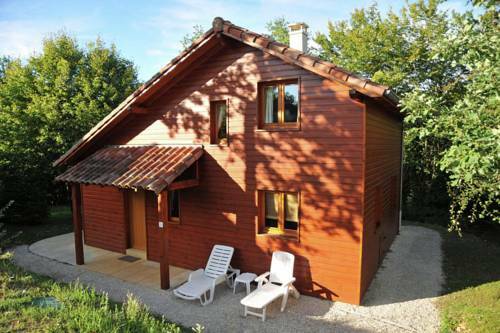 This chalet offers accommodation with a terrace and free WiFi. This chalet has 3 bedrooms, a TV, and a kitchen with a dishwasher and an oven. The bathroom comes with a bath or shower. The chalet offers an outdoor pool. If you would like to discover the area, horse riding is possible in the surroundings. Sarlat-la-Canéda is 28 km from Souillac Golf & Country Club 6P Deluxe, while Brive-la-Gaillarde is 37 km away. The nearest airport is Brive-La Roche Airport, 37 km from the accommodation. 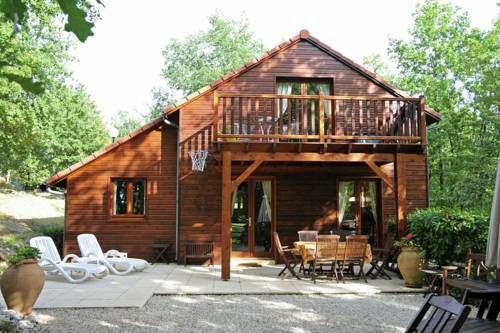 Chalet Souillac Golf & Country Club I is located in Souillac and offers a tennis court, a garden and a terrace. Guests staying at this chalet have access to free WiFi and a fully equipped kitchen. The chalet has a TV. The bathroom is equipped with a bath and shower. Sarlat-la-Canéda is 28 km from the chalet. Brive-La Roche Airport is 37 km from the property. Situated in Souillac, Chalet Souillac Golf & Country Club II provides accommodation with a terrace and free WiFi. The accommodation is 28 km from Sarlat-la-Canéda. This chalet is fitted with 3 bedrooms, a TV, and a kitchen with a dishwasher and an oven. The bathroom comes with a shower. Guests can also relax in the garden. Brive-la-Gaillarde is 37 km from the chalet, while Rocamadour is 28 km away. The nearest airport is Brive-La Roche Airport, 37 km from Chalet Souillac Golf & Country Club II. Hotel Souillac Preferred hotel ! Le Pavilion Saint Martin is a charming building from the XVIth century, located in Souillac, in the heart of the Dordogne. Le Pavilion Saint Martin features double, triple and quadruple. They are very comfortable and the decoration combines tradition and modernity. Le Pavilion Saint Martin is equipped with an elevator, a free Wi-Fi internet access and a private parking on the site. Coeur de Souillac is offers bed and breakfast accommodation in the heart of the medieval town of Souillac, a 5-minute walk from bars and restaurants. Free WiFi access is available. Each bedroom is tastefully decorated and has a private bathroom with a shower and a hairdryer. In the morning, a hearty breakfast with fresh produce is served. It includes fruit juice, pastries, bread, cereals, jams and hot drinks. An array of activities can be enjoyed on site in the surroundings, including cycling, fishing and hiking. The property offers free parking. Offering a restaurant, Auberge du Puits is located in Souillac. Guests can there enjoy a garden with a terrace, as well as free Wi-Fi access. Rooms at Auberge du Puits will provide you with a flat-screen TV. The private bathroom offers a bathtub or a shower, a hairdryer and free toiletries. Some rooms have a balcony. On site, guests can have their meal in the restaurant or enjoy a drink at the bar. An array of activities can be enjoyed on site or in the surroundings, including cycling or golf playing. Souillac Train Station is just a 4-minute drive from this property, which offers free parking. This hotel is located in Souillac, a 15-minute walk from the river Dordogne. It offers rooms with a private balcony overlooking the garden and swimming pool. Rooms at Le New’s are with free Wi-Fi, a TV and a private bathroom. Guests are invited to relax in the hotel’s bar or on the terrace by the pool. The restaurant at Le New’s Hotel serves traditional and regional cuisine and a breakfast daily. Le New’s offers free private parking and it is a 5-minute drive from the A20/E09 motorway, which provides access to Brive-la-Gaillarde and Montauban. This charming, traditional French hotel is nestled in a quiet, peaceful area in the little town of Souillac. The hotel offers comfortable, well-equipped accommodation and good facilities. All of the rooms have a hairdryer and cable TV. The restaurant has a wide selection of wines and serves traditional specialities from the Quercy-Périgourdin with a modern, innovative twist. Le Quercy offers bright, spacious rooms with private balconies, satellite TV and free Wi-Fi internet access. It is located just a few steps from the medieval city of Souillac. Le Quercy serves a buffet breakfast, with the option to take it in your room or eat outside. The hotel is easily accessible from the A71 and A10 motorways, and free private parking is available. Below here is the hotels map of Saint-Sozy. Names and details of Saint-Sozy hotels can be shown on the map clicking on the prices icons.